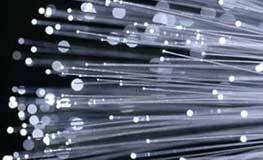 The Fiber Optics Institute on-line provides a wealth of knowledge in all aspects of fiber optics. Press the "Forward" button at upper right to view some sample sections. Reading from the lower left, the electrical signal (voice, data, video) is converted by the transmitter into a blinking LED or laser. The pulses of light enter the core of the fiber, and travel to the other end of the fiber link, where they are detected or seen by the receiver, which converts them back into their original electrical state of voice, data, or video. If the electrical input to the transmitter is digital, (sending 1s and 0s), the transmitter will turn the light source on and off. If the signal is analog, perhaps for a CCTV camera, the light will brighten and dim to copy the analog wave form. This brightening and dimming (analog) or turning on and off (digital) happens at a very high rate of speed. It is important to know that the light signals traveling in a fiber optic strand are invisible to the human eye. It is a VERY IMPORTANT SAFETY ISSUE that the technician should NEVER look into the end of a fiber connector without checking first to see if there is any light energy being transmitted. While LEDs will not damage your eyesight, the lasers used in fiber optics are generally Class 2, and can harm vision with repeated exposures. Light signals in fiber optics cannot be seen by the human eye. Light sources used in fiber optics are safe to view with the human eye. Slayton Solutions Ltd. Chicago IL USA (708) 212-5150, slaytonsolutions@sbcglobal.net. Copyright 2016.